This easy Thai beef salad recipe is Keto, Paleo, Whole30 and gluten-free. 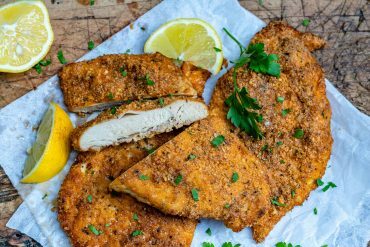 It’s a one-size-fits-all kind of recipe and best of all, you can make it in less than 20 minutes. Today I am going to show you how to make an easy Thai beef salad (a.k.a Thai steak salad) which is one of the best diet recipes ever. And I’m saying that because it’s perfect for the Keto, Paleo and Whole30 diet. Oh, and it’s gluten-free as well. But more importantly, it’s super delish and it took me just 17 minutes to make. That’s quite a big deal when you consider that by eating it, you’re on 3 healthy diets at the same time. Now, as you know, when it comes to food there’s always a secret, a small twist or a trick, that can turn it from ‘meh’ to deeeliciousss. And I am going to share with you a few useful tips and tricks so you can make the best Thai beef salad ever. 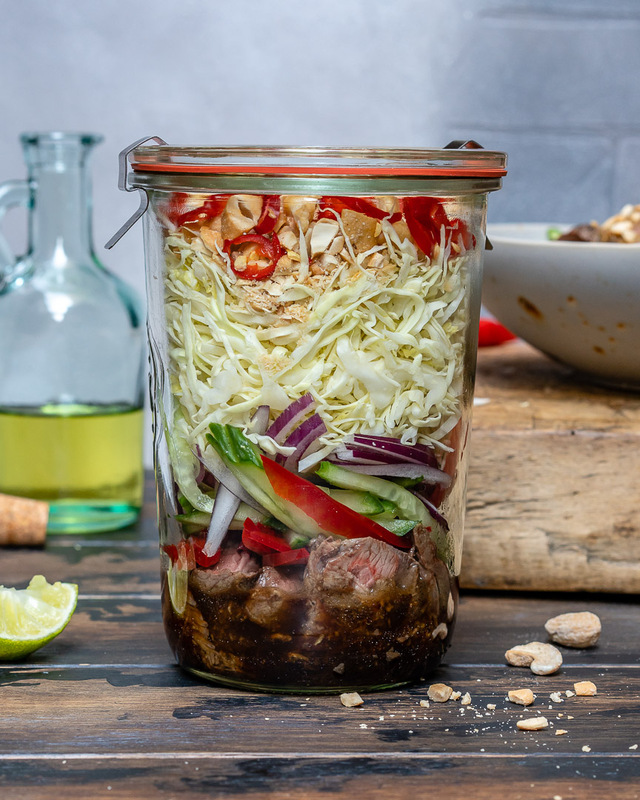 I am going to tell you what dressing to use, what to serve with it, and how to adapt this easy Thai steak salad recipe to your taste. So without further ado, let’s turn this dish from meh to deeeeliciousss. To make the best Thai beef salad ever, you first need to make a perfect steak. Pay close attention to this as it’s the most important trick. Take the steak out of the fridge at least 30 minutes before cooking and let it reach room temperature. Rub it on both sides with salt and pepper. Preheat the pan and add a bit of oil. Cook for about 5-6 minutes to make it medium-rare, flipping it halfway through. If the cut is thicker than the one I used, increase the cooking time by an extra minute or two. Remove from the pan and let it rest on a plate for about 5 minutes. Then slice it. If you’re on Instagram, check out my Highlights to see how I usually cook steak. I made it with a Thai-style soy sauce dressing that goes perfectly with any steak salad. 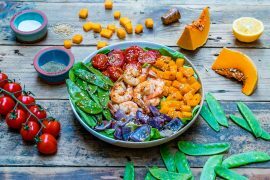 It has a great balance between citrusy and salty and it’s Keto, Paleo and Whole30. But if you don’t have all those ingredients handy, I’m sure you can find some extra virgin olive oil and a good balsamic vinegar in your cupboard. Just drizzle the spicy Thai beef salad with these two and trust me, it will taste amazing. 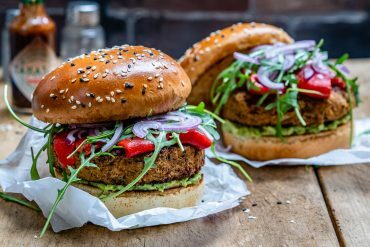 It’s super flavorful and I use it in many recipes, but keep in mind that it is not Keto, Whole30, nor Paleo. 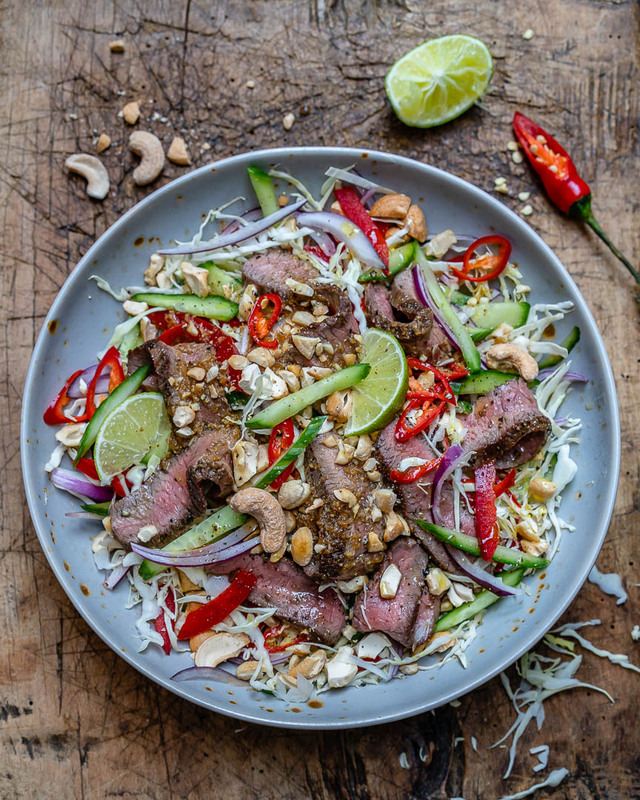 Now let’s move on and see what you can serve with this easy Thai steak salad. 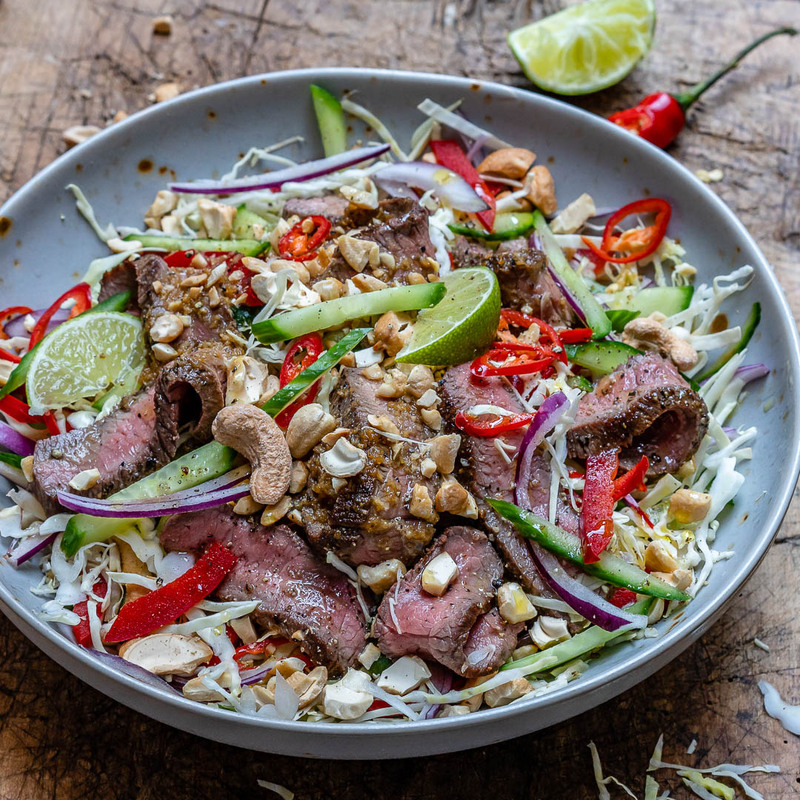 This Thai steak salad is quite filling for most people, but if you’re like some foodies I know who can’t even imagine being satiated from a salad, then you’ll surely need a few extras. And the best addition would be roasted veggies. You can serve it with roasted sweet potatoes, asparagus or cauliflower. 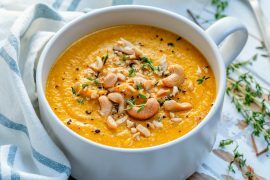 Or, you could try it with this delicious curried cauliflower soup. Now let’s see how you can adapt this easy Thai beef salad recipe to your taste. 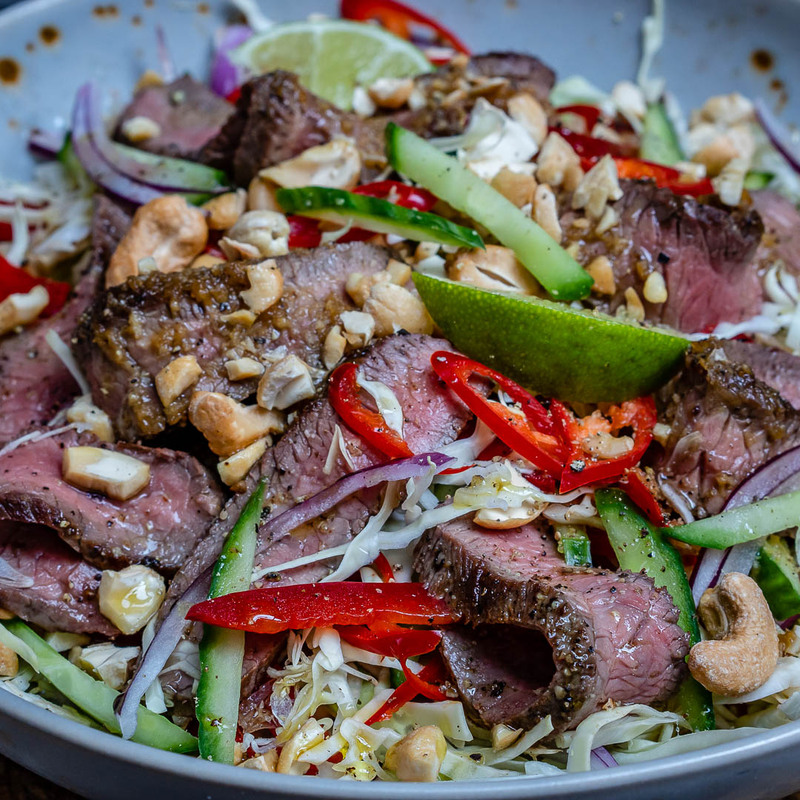 To make the best Thai steak salad ever, everything needs to fall into place. And what I mean is that everything needs to be just how you like it; the meat, the veggies and even the cooking method. So you can use your favorite beef like rump, ribeye or sirloin. Flank steak works too if you want to stir-fry it. And if you’re not a fan of beef, you can replace it with chicken or turkey, but in this case, the cooking time will be different. 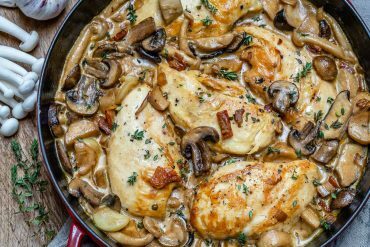 You’ll need to cook the poultry until it reaches an internal temperature of 165F/75C. 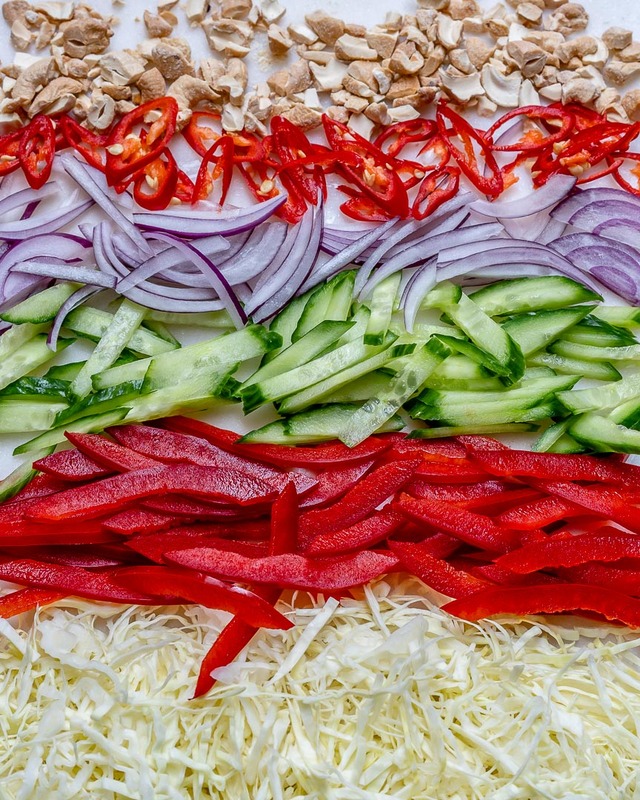 Furthermore, you can add your favorite veggies, just make sure you cut them julienne to maintain the Thai style. 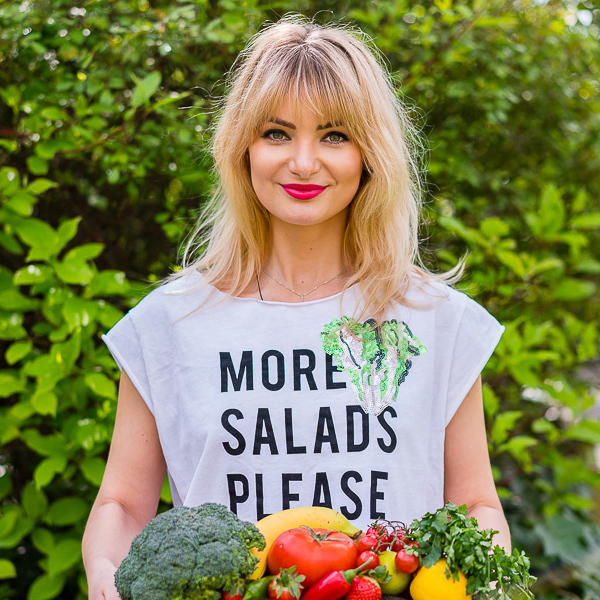 Any kind of cabbage or salad works great, and you can also add carrots and even fruits like mango or grapefruit. And that’s it for today, my dear foodies. Those were all the tricks you needed to know to make the best Thai steak salad ever. After making it, don’t forget to snap a few shots and post them on Instagram using the tag @theblondelish. And if you like this easy Thai beef salad recipe video and want to see more like it, please Subscribe to my YouTube Channel. 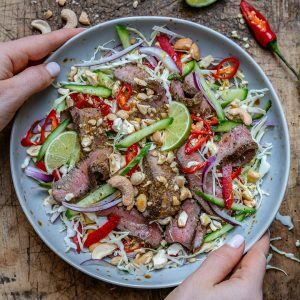 This easy Thai steak salad recipe is Paleo, Keto, Whole30 and gluten-free. 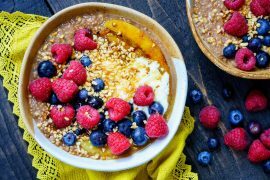 It takes just 17 minutes to make and it's super delish. Take the beef out of the fridge about 15-20 minutes before cooking and sprinkle it with a pinch of salt and pepper. Rub it on both sides and let it sit to reach room temperature. Heat 1/2 Tbsp of sesame oil in a large skillet over medium-high heat. Add in the beef and cook for about 6-7 minutes (for medium), flipping it half-way. Set aside on a plate and let it rest for 5 minutes, then slice it with a sharp knife. In a small bowl, add all dressing ingredients and whisk well to combine. 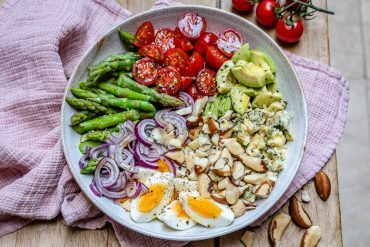 In a large bowl, arrange the chopped veggies and steak slices. Sprinkle with cashew and pour the dressing over. Gently toss to combine and enjoy! 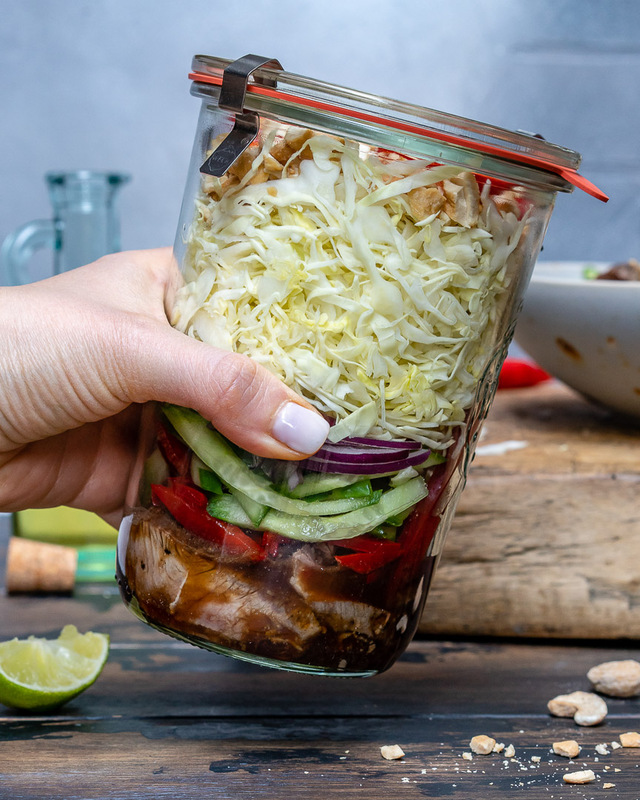 If you make it in a mason jar, start by adding the dressing at the base, then the steak, bell pepper, cucumber, onion, chilies, and cabbage. Keep refrigerated for up to 4 days. 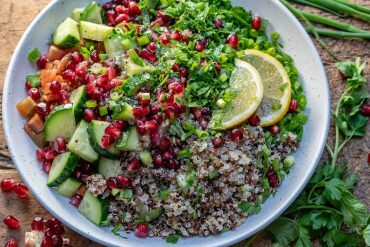 When ready to serve, toss everything into a bowl, mix to combine and enjoy! To make the best Thai steak salad ever, you should cook the steak perfectly. See the exact steps at Tip #1. 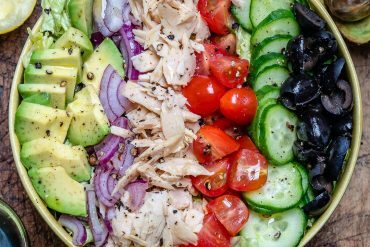 If you don't have the dressing ingredients handy, you can just drizzle some olive oil and balsamic vinegar and it will taste great. To make a peanut butter dressing that goes with any steak salad, check out Tip #2. You can serve it with roasted veggies like roasted sweet potatoes, asparagus or cauliflower. 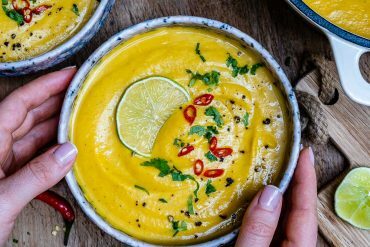 And you can also serve it with this delicious curried cauliflower soup. 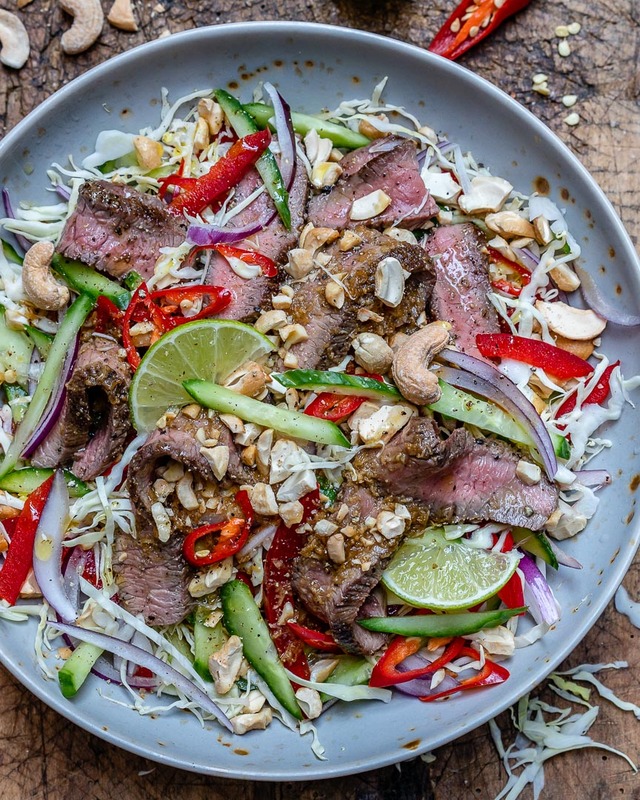 You can make this easy Thai steak salad recipe with rump, ribeye or sirloin. 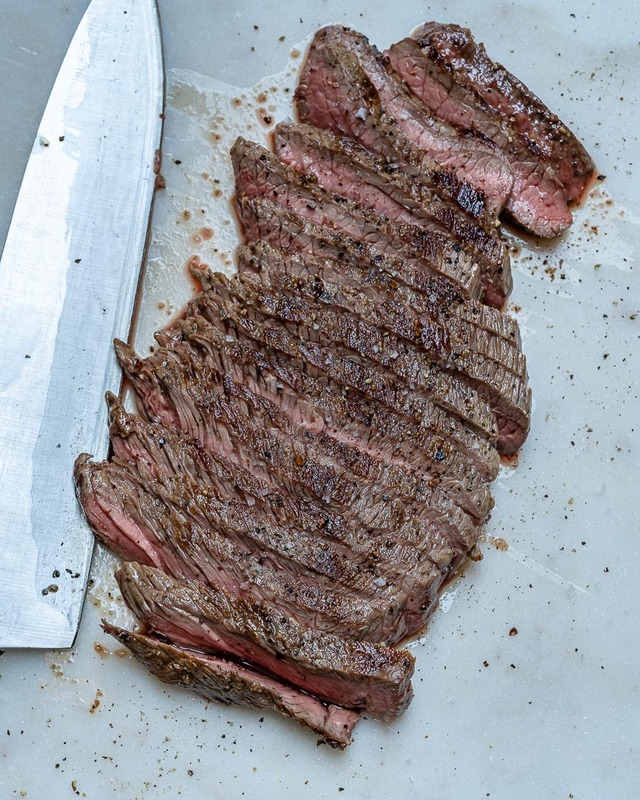 Use flank steak only if you stir-fry it. Moreover, you can replace the beef with chicken or turkey, just remember that the cooking time will be different. See more at Tip #4.